THE THREAT: There are villainous monsters, mutants, freaks, and warped masterminds in the world, beyond the ability of conventional police forces to deal with. THE SOLUTION: Recruit your own monsters, mutants, freaks, and warped masterminds, and give them warrant cards. Every large urban centre has its own Special Talents Response Team, a small cadre of unusual personalities with unusual abilities. Manchester's is the infamous GOON SQUAD, a team that has been operating continuously since the 1940s. Based in the heart of the city, their brief is to deal with threats ranging from the slightly odd to the very strange indeed. Join the GOON SQUAD as they bring law and a degree of order to a city under siege from the forces of weirdness. GOON SQUAD is a "prose comic," an ongoing episodic story that unfolds in handy monthly issues. During World War II, the major cities of Britain were protected against spies, saboteurs, and unusual threats by secret teams made up of superhuman Talents. 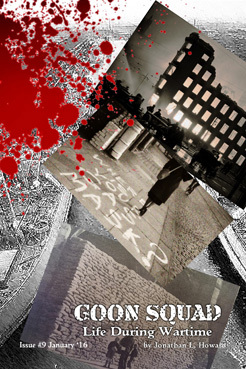 Manchester's was codenamed STOAT/6, the forerunner of the modern day GOON SQUAD. Comprised of three Talents -- the inhumanely strong BULLDOG, the pyrokinetic CORPORAL CROCODILE, and the acerbic GRANNY SPEAKE -- the team was ordered in 1944 to investigate a strange series of murders in the city. What they found was the work of a depraved and monstrous mind, a killer who experimented on his victims, and whose plans seemed to be approaching their unknowable climax. Now there has been a new killing that bears all the same hallmarks. Ian Mears, the REVENANT, interviews the last surviving member of STOAT/6. Has the dread VIVISECTOR truly returned? The secret may just lurk in the memories of one who experienced LIFE DURING WARTIME.